This is a guest post by Clive Duncan a Senior Consultant at TrinityP3. As a Director and DOP he has an appreciation for the value of great creative and outstanding production values, while also recognising the importance of delivering value for money solutions to the advertiser. We called it in 2008! And now the answer is definitely YES. With Kodak filing for bankruptcy protection earlier this year and the advances in digital technology, using film for making television commercials is dead. It was a mechanical problem. 35mm lenses and the size of a 35mm film gate created the default look of feature films that was the benchmark that video had to meet to truly rival film as a capture medium. By being able to produce a 35mm film sized digital photo-sensitive cell and then coupling this with a traditional 35mm movie lenses. There are still a few old filmophiles who cling the belief that film will always be superior to digital images, in the same way there are audiophiles who wax lyrical about the organic audio quality of vinyl records and old valve based amplifiers being superior to digital audio. But now the world has embraced digital image capture as the way to go. 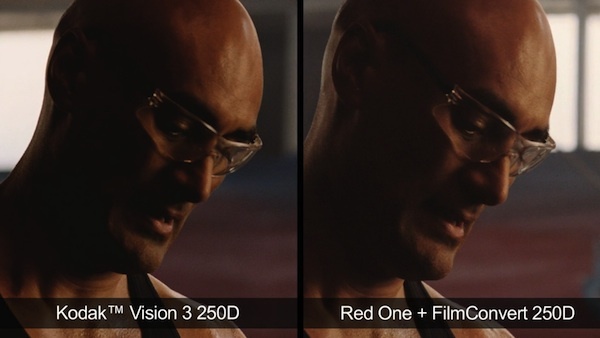 And if you want it to look like film there is FilmConvert. Check out the demo here. Many of the features that made 35mm film superior to digital media are being quickly superseded by technology. Film exposure latitude for instance has seen the new digital cameras deliver 12 – 14 stop latitude or exposure range, previously unheard of in digital mediums. And while it is true that a grain of silver halide on film is smaller than a HD pixel, there are now digital cameras that shoot at two or more times higher definition that high definition television. But to the layperson this makes no difference to the viewing quality, with virtually no one being able to pick the difference. So the small remaining advantages film has over digital capture is compromised by the viewing medium anyway. 1. It is far cheaper than traditional film, for an average 30 second TVC shot on 35mm film the saving is approximately $12,000 in film stock alone. 2. Digital media does not suffer from the same dangers that are associated with film i.e. getting scratched in either the camera or the laboratory or indeed being totally ruined in the lab due to a chemical or mechanical malfunction. The logistical (and financial) benefits of removing the lab from the production schedule are too numerous to detail. 3. These digital capture cameras that accept 35mm movie camera lenses are small, quiet and lightweight, they have no moving internal parts and a full days shooting can be stored on a pocket sized hard drive typically costing about $120. There are so many benefits, but in fact there is no real need to discuss the pros and cons of film Vs digital media as the market place has decided for us what is standard industry practice and what is required to meet broadcast image standards. In the last 9 months TrinityP3 have not assessed one TVC campaign that has been shot on film. So if a director wants to shoot your next television commercial on film you would have to ask why? Have you had a recent recommendation to use film? Leave a comment and tell us about your experiences.